Offering a comfortable and functional interior with a kitchenette, spacious dining and sitting area, the DVC Deluxe Van Camper is the ultimate package. The DVC is the perfect RV rental for two people. The Deluxe Van Camper is compact but still has all the amenities you'd expect from a larger RV. It's a perfect choice for one or two travellers. The rear sofa lays flat with the touch of a switch, enabling you to easily convert it into a queen size bed for a comfortable night's sleep. Image is representative only of the interior of our DVC. Actual RV received at pick-up may have a slightly different configuration. The kitchen is conveniently located in the centre of the DVC and includes a microwave oven, a two burner cooktop and a large refrigerator to keep food cool. Image is representative only of the interior of our DVC. Actual RV received at pick-up may have a slightly different configuration. The living and dining areas in the DVC are located at the rear of the RV providing a comfortable space to sit and eat. Image is representative only of the interior of our DVC. Actual RV received at pick-up may have a slightly different configuration. It's compact but has plenty of room for two people to sit and dine during the day. Note that floor plans may vary within each vehicle category. The spacious sitting and dining area converts to a comfortable queen size bed for sleeping. Note that floor plans may vary within each vehicle category. 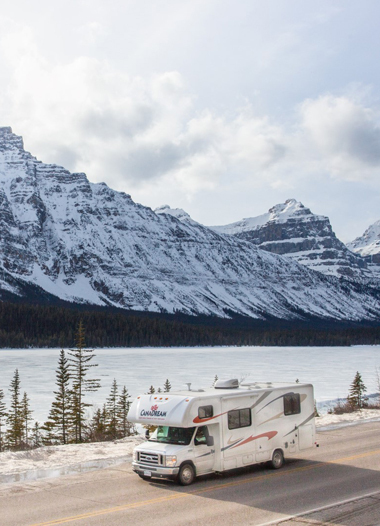 See what others have to say about their RV vacations in Canada in our DVC Deluxe Van Camper. Browse through our Guest Experience Brochure to choose the vehicle that's right for your RV vacation. Refer to our Guest Guide for information about driving and operating your RV. Download the Canadream Club App! The Canadream Club App can be downloaded through iOS or Android devices. It will allow you to communicate with CanaDream and access CanaDream Club discounts. Check Monitor Panel readings regularly. Careful usage and monitoring of RV resources as you use them avoids problems. Always be aware of the rate at which you are using fresh water, propane, available 12 Volt power and waste tank capacity. Read the pump! Know your fuel! The RV has a gasoline/petrol or diesel engine. DO NOT FILL IT WITH THE WRONG FUEL! Be aware of obstacles inside and outside of the RV when operating the slide. Do not, under any circumstance, drive with the slide in the OUT position. RVs are much taller than conventional vehicles. At least 3.7m (12 feet) of clearance is required. There are units on the roof such as the air conditioner, solar panels and vents that add height. Consider height when approaching: gasoline/petrol stations, under passes, tunnels, bridges, toll booths. The RV will not fit in parking garages or in drive-thru windows. Before getting in the driver’s seat, always observe the area around the RV. A car, bicycle, person or tree branch may be behind, near the top, or beside the RV and remain unseen until it’s too late. There are blind spots that must be checked when parking or backing up. The RV has a larger turning radius and will require more room than an automobile. Always reduce speed before turning and watch for tail swing. Always schedule the next Sani-Dump before reaching full. Using the campsite or other public facilities will extend the time between draining the tanks.